*Actual On Road Price of Hero Duet at the dealership may vary. The Hero Duet was launched along with the Hero Maestro Edge and both scooters share the same engine, although the Hero Duet comes with an all-metal body and completely different design. Like the Hero Maestro Edge, the Hero Duet has been completely developed and engineered in-house by Hero MotoCorp at its technical and R&D centre in Jaipur. While the Maestro Edge is targeted primarily at male customers, Hero has designed the Duet to appeal to riders of both sexes. The Duet gets chrome-finished side panels, 3D emblem, a grab-rail with an integrated luggage rack, tubeless tyres, and a digital-analogue meter console. The Hero Duet scooter also features an external fuel filling cap, mobile charging port located in the underseat storage space, a boot light, and telescopic front suspension. Built on a new platform, the 110 cc scooter is positioned between Pleasure and Maestro Edge in Hero’s line-up. The 110.9 cc, single-cylinder air-cooled, four-stroke engine makes 8 bhp at 7,500 rpm and peak torque of 8.7 Nm at 5,500 rpm. Priced at Rs. 47,250 (ex-showroom Delhi) for the LX variant, and Rs. 48,900 (ex-showroom Delhi) for the VX variant, the Hero Duet is available in two variants - LX and VX and in in 5 colours – Candy Blazing Red, Pearl Silver White, Grace Grey, Panther Black and Matte Vernier Grey. The Hero Duet’s metal body is shaped aesthetically, and the scooter has a neat design. What really works for the Duet is the subtle styling which does not appear over the top or loud. Moreover, the metal body not just looks appealing, but it also adds weight to the body, lending the Duet a solid build quality. But it also feels heavier than the Maestro Edge. The side panels get some chrome treatment as well as up front on the apron. The flanks also feature the 3D logo and the rear is marked by large tail lamp assembly. The instrument cluster is quite stylishly designed and features a small digital panel as well. The only downside is the switch gear and plastic quality, but the Duet does get a handy pass switch and side stand on indicator. The seat is quite large and well padded, and it offers ample space to the rider as well as pillion. There is a grab rail too for the convenience of the pillion with an integrated luggage rack, and the rear fuel filler cap goes well with the design. Dual-tone rear view mirrors and a multi-reflector taillight further add to the appeal of the Duet’s design. 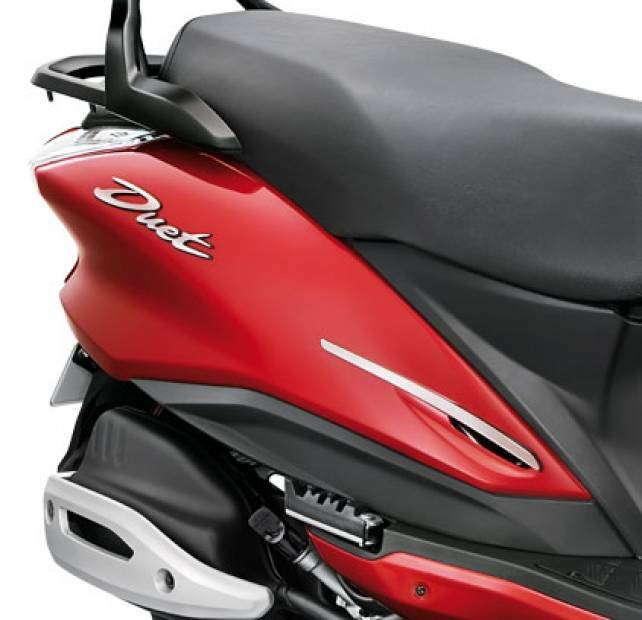 Powering Duet is the 110.9cc, air-cooled, 4 stroke, single-cylinder engine developing max power of 8bhp at 7500 rpm and 8.7 Nm of peak torque at 5500 rpm. The carburetted engine features a variomatic drive transmission with automatic clutch and is claimed to offer top speed of 85 kmph. The engine is smooth and refined, and easily reached 80 kmph, but is slightly slower than the Maestro Edge in pure acceleration, owing to the steel body and additional weight of around 6 kg. The Duet is happies cruising around 50-60 kmph, but can reach a top speed of around 80 kmph, when the engine begins to feel strained. On the feature front, Duet gets a slew of fitments such as mobile charging point, boot light, tubeless tyres, integrated braking system, dual coloured mirrors, large head lamp with side indicators, grab rail, under seat storage space, analogue speedometer, fuel level indicator, digital read out for odometer, twin trip meters and service due indicator. The ignition key is multi-functional and also acts as the steering lock, remote fuel lid release and remote seat release. Duet gets integrated braking - that means as soon as you apply the rear brake, this integrated braking mechanism applies the front brake too. Braking for the most part is impressive, despite the lack of a front disc brake. 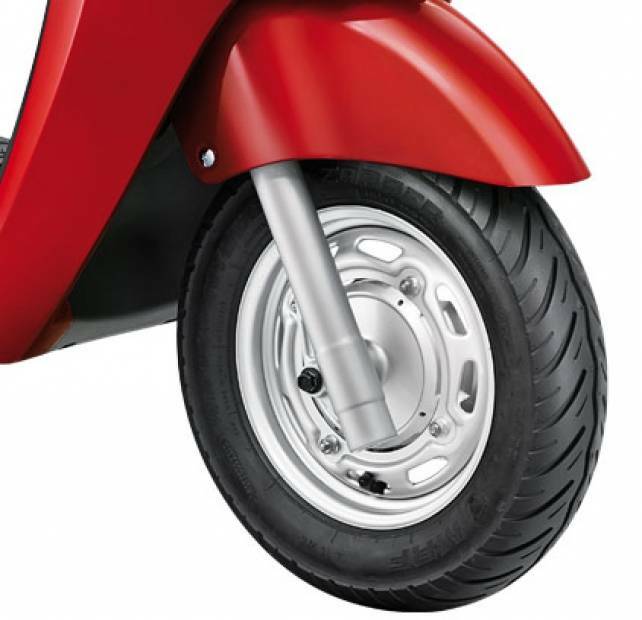 Alloy wheels are missing on the Hero Duet scooter; instead it gets sheet metal wheels with tubeless tyres on the front as well as the rear. Both wheels are of the same size – 10 inches and ride quality is quite good over most urban conditions, including broken patches. In the burgeoning 110cc scooter segment, Hero Duet has quite a few stiff rivals to beat like Honda Activa 5G, TVS Jupiter and Suzuki Let’s to name a few. The segment has received some worthy contenders over the years, but the strongest name in the 110 cc scooter segment remains to be the Honda Activa. Pricing wise, it’s slotted quite close to its sibling, the Hero Maestro Edge and that also becomes a rival with the Duet being only a little cheaper than the Maestro Edge. My new Duet VX, nearly 1year, had starting problem 5times. It get off during running and will not start at all. Engine is having bad sound. In all respect Hero's Duet is a big failure and I would suggest anyone o buy this vehicle. This bike is very troubling on daily, engine is very bad. middle of running it is automatically off the engine. don't purchase any one this bike, waste of your money. and hero show employees (HI-TECH CITY PHOENIX SHOW ROOM) also directly saying this is failure bike at the time of given for repairing.